In 1928 at the age of 30, while living in a quiet suburb of Paris the Belgian Surrealist painter René Magritte began work on what would become one of the most famous paintings of the 20th century, known in English as “The Treachery of Images”. The picture shows a pipe painted in a simple, naturalist manner similar to images in advertising or in children’s kindergarten books. Below the pipe Magritte painted, “Ceci n’est pas une pipe” (“This is not a pipe”). The painting has a playful and humorous quality and it is also an attempt by the artist to point out that image and words are not actual things themselves, they are concepts which we overlay with our direct experience. 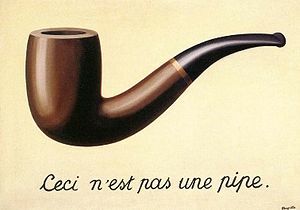 What Magritte is saying is that the painting itself is not a pipe; the painting is merely an image of a pipe. Hence the description, “This is not a pipe”. Yet even the description is a lie, as language is a conceptualisation of direct experience which on one level nothing can be said. So often we bring labels and concepts of what is happening to the situation rather than just being with the direct experience as it is. Through conceptualisation and labelling we create a false impression of how something really is whether a painting, statue, city or person etc… If we can learn to come into relationship with our bodies, simply stay with the sensation as perceived via our senses, allowing just the bare experience, fully attending to it in a relaxed and open awareness; then something alive, vibrant, constantly changing and moving is revealed; not a static solid fixed object or situation. So maybe next time we sit down to eat a meal we can try relaxing our awareness and be open, attentive and curious as the food touches our lips and mouth. We can notice the various tastes, textures and sensations as each piece of food reveals itself, stays for a moment and then vanishes again and again. Perhaps we could hold lightly any ideas or thoughts about what is happening and just be open through our body and our senses to the mystery of the direct experience as it unfolds.